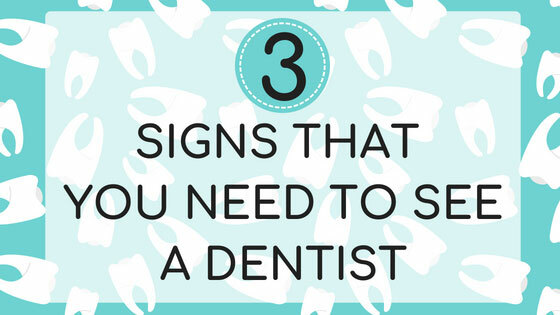 Oral health is essential, but some people struggle with knowing when to make an appointment. Prevention is always better than the cure, and by acting quickly, a patient may avoid discomfort and expensive treatment. When the gums bleed, it can be due to a few things. When someone changes their oral care habits, like adding flossing to their routine, it will take a short time for the gums to get accustomed to the process. During this period, it’s normal to see some slight bleeding from the gums. This should only last for a few days and is likely nothing to be alarmed about. As long as the brushing and flossing is kept up, the gums should stop bleeding. Bleeding gums can also be caused by hormonal changes, stopping smoking, diabetes, pregnancy, some medications, or even leukemia. The dentist can help determine if bleeding gums are localized or systemic. All too often, though, when the gums bleed, that means the potential for gum disease is there. Gum disease, also known as gingivitis, is a progressive condition that will eventually require intensive treatment. It’s caused by bacteria that grow and thrive inside the mouth, adhering to the space between the teeth and gums. This is called plaque, and it’s often visible as a soft white or yellow streak near the base of the teeth. If this bacteria is allowed to multiply, it will produce gum inflammation. The inflammation can lead to bleeding, especially if gums are brushed. Fortunately, this stage of gingivitis is reversible, as long as good oral healthcare processes are adopted and maintained.At this point, a dentist should be consulted, as they can remove plaque and provide a thorough cleaning. If the gingivitis is allowed to develop, the gums will eventually pull away from the teeth, potentially exposing tissues that can be permanently damaged by exposure and bacterial infiltration. Sensitive teeth come in all forms. Some are triggered by cold foods or beverages, some by hot substances. 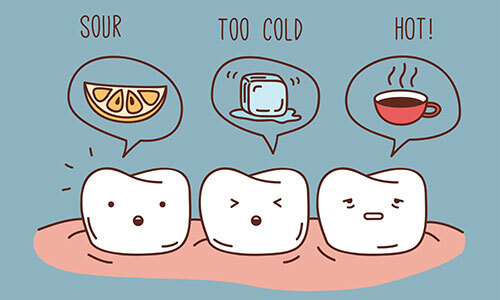 Some teeth are bothered by sweet foods and drinks, some by sour foods. Some teeth are sensitive to flossing, or even brushing. Sensitive teeth usually produce a slightly sharp pain when exposed to their trigger, and once the pain is gone, it’s tempting to believe that the underlying issue isn’t worth paying attention to either. However, there are many instances where sensitive teeth are a worrying sign of something else. When the tissue beneath the enamel, the dentin, is exposed to the environment, it can produce sharp pain. There are several instances that might result in exposed dentin. 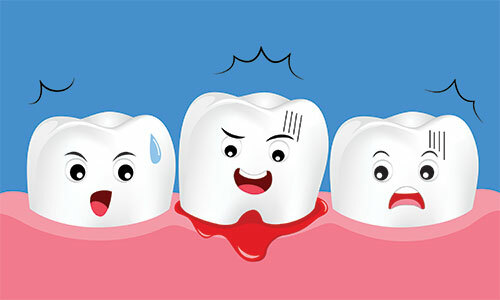 Chipped or cracked teeth, for example, can be one reason why, and may follow an injury to the face or jaw. Teeth grinding, which often happens during sleep and without the patient noticing, can also wear down the enamel and expose the dentin. Even overly aggressive brushing can wear away the enamel and produce sensitive teeth. And, yet again, gingivitis can be at the root of it. When the gums pull away from the teeth, the tooth’s root may be exposed, and this can also produce a sensitive response to certain stimuli. Bad breath, medically termed halitosis, is usually associated with pungent foods, but it can also be a sign that something is going wrong in the mouth, or in other parts of the body. Halitosis is normally the result of foul-smelling particles that have accumulated in the oral cavity. This can certainly be a powerfully odorous food, but it may also be the buildup of dead cells or by bacterial toxins. Persistent halitosis is a general sign that a dentist appointment should be made. What could be behind it? A primary culprit is, again, gingivitis. Gingivitis means there is a problematic bacterial buildup close to the teeth, and this bacteria, as a byproduct of their existence, produces toxins. Those toxins are unpleasant smelling. Halitosis can also be caused by a poorly fitted dental device, as this may produce a trapped area that bacteria can get into. A dentist can confirm whether a dental device has been properly installed. Yeast infections (of the mouth) and dry mouth can also produce halitosis. Dry mouth is worth investigating on its own, as it may signal problems with the salivary glands. Cavities can also produce halitosis. Cavities are also caused by bacterial buildup and are often the result of poor oral hygiene. As teeth are compromised by cavities, the resulting decay will produce a foul odor. Sometimes persistent halitosis can be a sign of an underlying health issue. These health issues can range from something as simple as sinus issues or post-nasal drainage, to GERD, acid reflux, or stomach ulcers. It can also be a sign of something much more serious, such as kidney disease or renal failure.